I know I won’t be writing series for a while after that, those are quite troublesome in the sense they tend to drag on and I’m not much of a multitasker—I barely have enough energy to wake up and I write slowly. I also want to play with my atmosphere models and stand-alone stories. And yes, I need a MITgcm model for the novel in question. An alien panet is a fascinating thing to design and summer is the perfect time to let your computer do the long math while you play outside. The tricky part here is the alien topography. MIT General Circulation Model is a numerical model designed for study of the atmosphere, ocean, and climate. It has the ability to simulate, using one basic algorithm, both atmospheric and oceanographic flows at both small and large scales. Its adjoint capability enables it to be applied to parameter and state estimation problems. The non-hydrostatic capability allows the model to simulate overturning and mixing processes. When used in conjunction with the finite volume representation of topography (known as shaved-cells or partial steps using the method of cut cells) the model provides a flexible tool for studying mixing process and dynamical interactions with steep topography. As a bonus, I have plenty of time to think about the novel’s cover—it’s science fiction, but it’s not set in space, though still being a part of the same universe in which Falaha’s story takes place. I drew some maps for Rjg before and they need more work. This is the world the story will take place in, one of the continents of planet Dannan, during the period of its early civilizations. 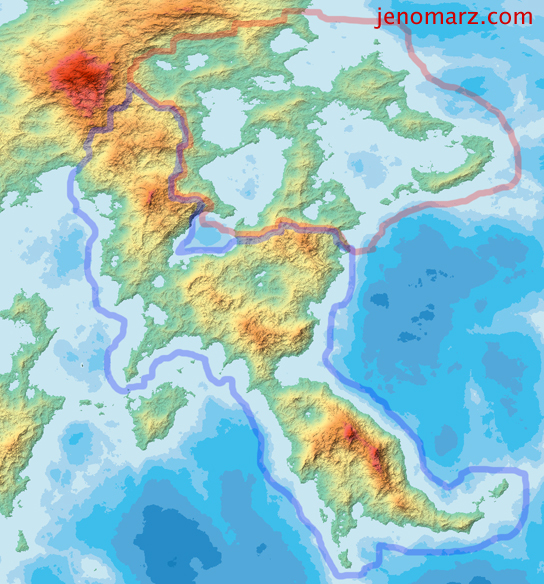 The blue line marks the habitat of the semi-nomadic Danna, and the red line encompasses the Ynu Empire. Both humanoid species and their multiple nations are not very friendly towards each other, hence the clash of the cultures, resulting of one big, bad war. Another tricky part with the model? The planet is on its side; it behaves differently from Earth, and even from planets with more moderate obliquity. I’ve already built the planetary system and evolved it for some time to see its dynamics and stability. I will probably tell more about it in the future posts. From geological standpoint another interesting part of the worldbuilding here is that the story is set during the time when our universe is only ~11 billion years old, and that planet, of course, is much, much older than 3 billion years. There, so many things to play with, so many words to write! Well, I’m dealing with an alien world which has no connection to Earth and humans in any way. I’m not writing fantasy, so if I have the means to produce accurate setting, I would go for it. I need to know the physics of the planet to design and play with their early technology realistically. I also need seasonal wind map and (seasonal) ocean current map, even the most basic ones, so I don’t know yet how much resources my model will consume. It’s quite an interesting experience, and if something good comes out of this, I might even write a science paper about the model. It would be a great asset for astrobio folks. So far I’ve seen only simplified model that is similar in idea to mine, but without any topography. Thanks to it I could develop a basic sketch of my planet. But beyond that everything is a wild guess.